Pat has been building, repairing and sailing boats for over 25 years, and is currently working on the Traditional Boats of Ireland Project to record and document Irelands disappearing maritime heritage. He is a pioneer of 3D scanning full size boats in the field, and developed the laser scanning and digital reconstruction of archaeological boats and ships timbers. Pat works as a maritime archaeologist, and projects completed to date include documenting a large number of traditional Irish vessels, as well as digital reconstructions of the 16th C. Drogheda Boat for the Underwater Archaeology Unit of Ireland, the Newport (Wales) Medieval Ship, the Grand Hotel Shipwrecks in Stockholm, the Poole Iron Age logboat and the 14th C. Bremen Cog. Pat is currently working on the 7th C. Anglo-Saxon “Sutton Hoo” ship and is also completing a PhD in Maritime Archaeology at the University of Southampton, where he lectures in boat recording and digital reconstruction. 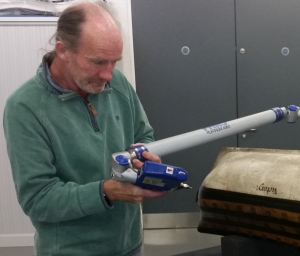 Pat 3D laser scanning the 1737 Balchen model of HMS Victory on behalf of English National Maritime Museum at Chatam Dockyard.